No Insurance points. No DMV Points. Free consultation with Wake County speeding ticket lawyer Wiley Nickel. Call NC traffic ticket lawyer Wiley Nickel at (919) 585-1486. A simple speeding ticket can have very serious consequences. In addition to a fine, your insurance rates could go through the roof and you could possibly lose your drivers' license. By paying the fine, you are pleading guilty, possibly to a misdemeanor offense. All of these bad consequences can be avoided by hiring a lawyer to handle the matter for you. Do not pay a speeding ticket without talking to a lawyer. By paying tour traffic ticket, you are pleading guilty and could have very some severe consequences. Contact our Cary, North Carolina office to arrange a free consultation with traffic ticket attorney Wiley Nickel. For many clients a reduction to the no-moving violation of improper equipment may be the best option. North Carolina Attorney Wiley Nickel helps his clients contest speeding or other traffic tickets. In many cases, he has been able to have charges for a moving violation reduced to a lower level violation or dismissed altogether. In other cases he may be able to get your traffic citation reduced to the non-moving violation of "improper equipment." He may be able to appear in court on your behalf and handle the entire matter for you, keep your insurance rates from rising, and help you keep your driving privileges. If your license is revoked as part of a plea agreement or sentence, he will work to arrange limited driving privileges. Hiring a lawyer for speeding or other traffic ticket defense may be a practical, reasonable option. By successfully contesting a speeding ticket, you may keep your license, your good record, and prevent a later moving violation from being charged as a second offense, subject to higher penalties. How fast were you going? What was the actual speed limit? Was the technology used to clock your speed reliable? Have you ever used a PJC? Were you charged with a violation on NC GS Section 20-141(J1)? A charge of driving more than 20 miles per hour over a 55 mph limit is very different than a charge of going 55 in a 25 mile per hour zone. Every situation is unique, and only after talking to an attorney will you know what your options are. The all inclusive cost to hire Raleigh Speeding Ticket Lawyer Wiley Nickel to handle your traffic ticket begins at $98. The flat rates does not include court costs and fines (those generally range from $188 to $263 for most speeding ticket cases). Mishandling your traffic ticket can be very costly. If your ticket is handled the wrong way you can get costly insurance points. Each insurance point will cause your premiums to rise for about $200 per year for the next three years. For many clients a reduction to the non-moving violation of improper equipment is the best option. A reduction to improper equipment means no insurance points and no DMV points. The flat fee for a ticket that is eligible for a reduction to improper equipment is also $98. The costs of $263 for an improper equipment reduction are slightly higher because there are extra court costs and fines when tickets are handled this way. The benefit is knowing that you won't have DMV points or insurance points with the improper equipment reduction. Call 919-585-1486 or e-mail Traffic Ticket Lawyer Wiley Nickel at wiley@wileynickel.com or Speeding Ticket Attorney Kristi Haddock at kristi@wileynickel.com and contact our Wake County office to schedule a free consultation about your speeding tickets or other traffic violations. We serve clients in Wake County and Chatham County in North Carolina. Our office is located in Cary, NC but for most clients we are able to handle these cases over the phone and by sending the necessary documents via email. It depends on how fast you were driving, your prior DMV record, the record of those in your household, and how your ticket is handled. After listening to that information about your record I’ll be able to tell you how your ticket will affect your insurance rate. Generally it’s an increase of $200 per point per year. So a speeding ticket could cost you an extra $600 over three years if it is not handled correctly. 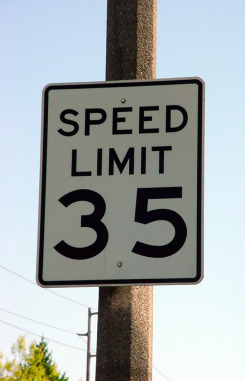 North Carolina law requires individuals to appear in Court when they receive speeding tickets at specific high rates of speed. In most situations I’m able to get your court appearance waived and can save you the considerable time and effort of appearing in Court. It’s not a pleasant experience and it can definitely take a while. Every client at my law firm is sent a “waiver of appearance” form which allows me to handle their case without the client being present. There are certain situations where it is required for a client to appear in court but it’s usually a rare situation. For more information on how your Raleigh, NC speeding ticket will be handled please contact me directly. I’ll be happy to speak with you on the phone any time. Yes. However, the Law Offices of Wiley Nickel, PLLC has ways to help you keep your license. During your free initial consultation we will discuss a number of factors which will help us in dealing with the Wake County District Attorney to help you keep your license and keep your insurance rates down. While the DMV in your state will probably find out about the North Carolina traffic citation, the question of how the citation will affect your insurance depends on your local DMV and how your NC traffic ticket is handled. It will very likely follow you back home so it’s important to deal with it promptly. I can appear on your behalf to help fix your ticket in order to keep your insurance rates low and to make sure the damage is lessened or eliminated. A North Carolina law went into effect that requires officers to arrest any 16 or 17 year old who has a learner’s permit or a provisional license if that person is charged with a criminal moving violation. Along with this arrest there is an automatic license suspension for thirty days regardless of whether the teen is convicted of the offense. A teen driver charged with driving 15 mph above the speed limit, careless and reckless driving or driving in excess of 80 mph is going to be cuffed and taken down town for mug shots and fingerprinting. If you have been charged with “prearranged racing” you could lose your car if convicted. Call my law office to speak with me about your case if you have been charged with this offense. "How can I fix a traffic ticket where I pled guilty?" You might be able to re-open your case by filing a Motion for Appropriate Relief. Also known as a MAR motion. MAR motions can be used in traffic cases. An example could be a situation where a driver has represented himself in court without correct knowledge the law and ends up with an insurance increase or suspension of license as a result. Can you get my ticket reduced to the non-moving violation of "improper equipment" in Wake County & Chatham County, NC? Original ticket says you were charged with speeding 20 mph or less over the posted speed limit and not in excess of 85 mph. Assuming eligibility we charge a flat fee of $370 for improper equipment eligible cases. That covers all court costs and fines. Call the Law Offices of Wiley Nickel, PLLC for help! Make sure your car insurance rates stay low by contacting a speeding ticket attorney who knows how to handle speeding tickets and get the best possible outcome. Losing your driving privilege is a very unpleasant experience and can possibly be avoided if you handle your case the right way. Call me at 1 (919) 585-1486 for a zero cost consultation about your speeding ticket or traffic citation. I handle speeding ticket cases in Wake County and Chatham County, North Carolina including the cities of Raleigh, Cary, Apex, Morrisville, Wake Forrest, Garner, Pittsboro, Siler City, Goldston and Fuquay Varina. My office is conveniently located in Cary, North Carolina near the SAS campus and I-40 at exit 278 (Harrison Ave exit).